The film is more expansive, and significantly darker than its predecessor, The Lion the Witch and Wardrobe, and this shift in tone is also reflected in Harry Gregson-Williams’ score. 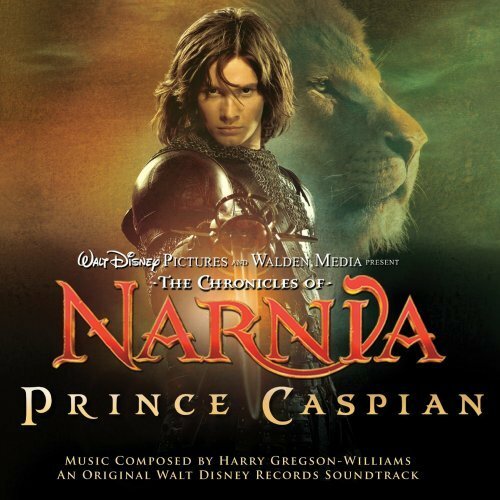 I was disappointed with the first score in this series, so it’s very encouraging that Prince Caspian is better – it largely dispenses with the new age electronica that bogged down too much of the original album, and instead concentrates on old-fashioned orchestral and choral fantasy scoring, at which Gregson-Williams is very good indeed. Some of the action and battle sequences are very impressive: cues such as “Prince Caspian Flees”, “Raid on the Castle” and “Battle at Aslan’s How” throb to valiant power chords, stirring choral work, and large orchestral forces, although these are tempered by somewhat darker material in cues such as “Miraz Crowned” and “Sorcery and Sudden Vengeance”, in which the choir offers slightly more threatening vocalizations, including throat singing. Alternately, cues such as “Journey to the How” and “Arrival at Aslan’s How” offer soft, reflective moments of delicate beauty or soaring thematic depth, especially when Hugh Wilson’s electric violin takes the lead. In several of these cues Gregson-Williams recapitulates his heroic melodic content from the first film in new settings, with very enjoyable results. One of the conclusive cues, “Return of the Lion”, is absolutely magnificent, rising to glorious heights of quasi-religious, full-throated choral and orchestral rapture and thematic power. Like its predecessor, the album concludes with four songs, written for or ‘inspired’ by the movie, one of which – “The Call” by Russian indie singer-songwriter Regina Spektor – is actually surprisingly good.